Very desirable eight-tube Truetone with a colorful, backlit 6-inch Network stationized dial, burled and straight grain walnut with amazing sound from its 8-inch Rola speaker. This classic cabinet has been refinished using the very finest toning and finishing lacquers, producing a gorgeous finish. 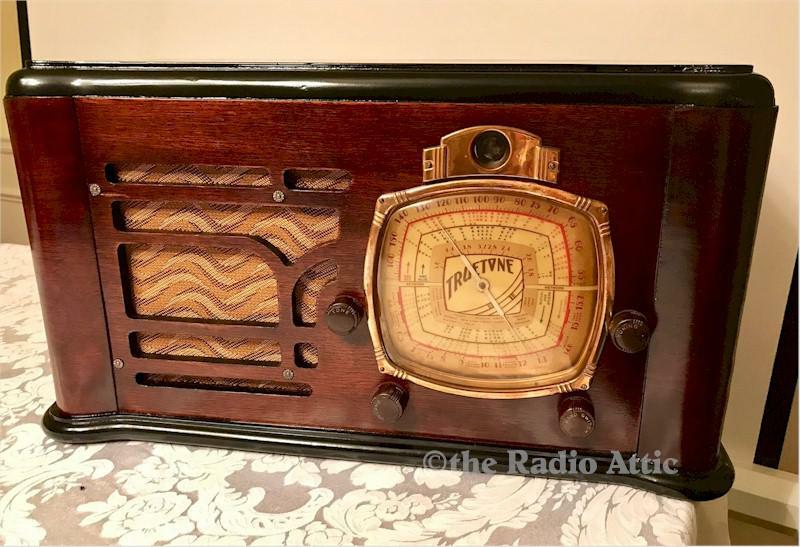 The electronics have been completely restored (no shortcut repairs and it is internally fused for your safety), NOS bright eye tube and it plays very nicely on the AM broadcast band and shortwave bands. In addition to adding a MP3 input, I am including a Bluetooth receiver so you can directly connect your MP3 device or stream your music using your own Bluetooth device. A USB charger cable is included for charging the device's battery. This would be a superb radio for anyone's collection. 21"W x 11-1/2"H x 9"D.